On 5 March 2018, we hosted the interreligious choir Pontanima from Sarajevo at Durham University. Pontanima are known as an important peace-maker in post-war Bosnia-Herzegovina, composed of members from different ethnic and religious groups and performing songs from Bosnia’s different religious traditions (Jewish, Orthodox, Islamic and Roman Catholic). Through this, they send a powerful message of appreciating diversity and reconciliation. The eclectic elements of Bosnia-Herzegovina’s religious heritage are thus understood as an asset and precondition in which the trauma of the war can be overcome – based on a memory of Bosnia-Herzegovina as a multicultural nation. Nedžad Avdić from Srebrenica was travelling with the choir on their UK tour (Cambridge, London, Durham). Nedžad is a survivor of the atrocities that were committed in Srebrenica, having been shot multiple times and witnessing the killing of many others. By telling his personal story, Nedžad is trying to raise awareness of the detrimental consequences of hate of any kind. He says that he had returned to Srebrenica to “show them I am still alive”. 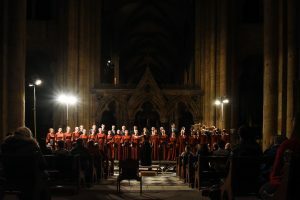 In that sense, one might think the combination of the choir, which emphasises a notion of reconciliation, and a survivor who expresses the need to remember the atrocities, may seem unusual. Is this about retribution or reconciliation? But it is exactly that that Nedžad Avdić’s story and the choir may be read as: namely the need for suffering to be acknowledged so reconciliation can happen. Independent of which side the suffering has happened, it seems to be crucial for pain and injustice to be recognised and taken seriously if they are to be transformed into a creative energy (such as music, with the example of Pontanima). This does not mean that we need to look at reconciliation as a linear phenomenon or with a clear directionality (suffering > acknowledgement > reconciliation), but instead to recognise the importance for personal testimonies to be listened to throughout. Peacebuilding, I would suggest, should therefore create spaces in which suffering can be acknowledged. Those spaces can then give rise to conversations and transformations, where the arts can deploy their special impact. This is not to say that acknowledgment alone is sufficient to overcome societal divisions (indeed, a critique that has often been voiced against the South African Truth and Reconciliation Commission has been its lack of focus on material reparations for the victims of apartheid). Instead, it means to engage in a serious conversation with those who want or need to remember and have felt the impact of war on their own lives.